WELCOME to The Lagoons located in Whistler Village. The Lagoons is located steps from the Village stroll and Whistler Marketplace with restaurants, stores and entertainment on your doorstep. In the summer, it is a very popular area for biking, hiking, golf & has a swimming beach nearby at Lost Lake Park. Lost Lake trails and lake are close by offering hiking and XC biking trails. You are across the street from Marketplace with all the shops you need, and Whistler Olympic Plaza which has a great children's playground, large park community space and stage where you can catch an array of free performances. ​​​​​​​In the Winter you can walk through the Village to the slopes (approx. 5 mins) or jump on the free shuttle bus located just outside the complex that will drop you at the base of Whistler mountain. You are a short walk away from tons of xc skiing and snowshoeing trails plus right across the street in the Olympic Plaza there is free skating rink and a small tubing area for the kids. This townhome is located on the ground level and spread over one floor. There is a large entry with seating and storage perfect for sports equipment or hanging clothes. This opens up to the living and dining rooms that can comfortably seat up to 6 guests. You will be toasty warm with your gas fireplace in the winter and there is a queen sofa bed in the living area for extra guests. The home has a fully equipped kitchen enabling you to prep an energizing breakfast in the mornings or a hearty home cooked meal at night. The spacious and bright master bedroom boasts a queen bed, large closet and en suite bathroom. The second bedroom has 2 twin beds which can be combined to make a king if requested in advance and a second full bath across the hall. 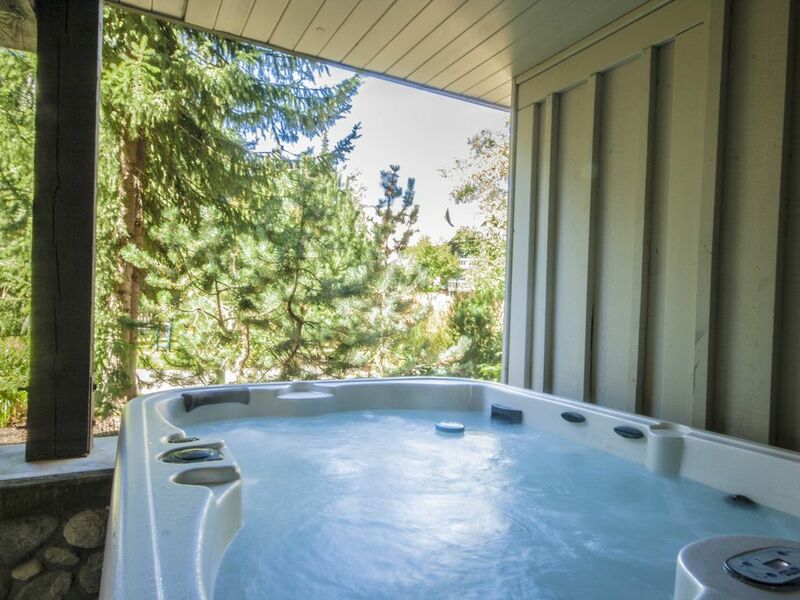 The back patio door leads you to your own Private Hot Tub which is the perfect start or end to any day. A washer and dryer can be found in this property with laundry powder included for your convenience. One secure underground parking spot comes with this lovely home. Any additional cars will need to be parked off site in paid lots. Free WiFi, cable tv and local calls are also included. PLEASE NOTE: There is no smoking inside or outside the units at the Lagoons. Smoking anywhere on the property, including balconies, will result in a fine. About Harmony Whistler Vacations Ltd. Here at Harmony Whistler Vacations, we live, work and play in Whistler. We are available all year round to book your perfect vacation. We understand that the multitude of accommodations, activities and travel options available to choose from can be overwhelming. Tell us what kind of vacation you want and any specifics in regards to location, activities and budget etc and we will tailor a package to suit all of your needs! Just need accommodation or advice? No problem, get in touch. We aim to provide a personable, boutique service. Whatever your request, we try our best to make it happen! View more about Harmony Whistler Vacations Ltd.
Great location, shuttle is empty when picking up right across the street. Groceries and liquor across the street, yet quiet at night. A little cramped for space but very comfortable. Thank you for your review Julian, we do love the location of the Stoney Creek properties. We do have a number of 3 and 4 bedroom homes if you want something a little larger next time. Great to hear that you enjoyed your time in Whistler. Close in, but not too close. Place was clean and well stocked for all our needs. Will come back. Note, you need to add better lighting master bedroom. Also can you put some salt and pepper in the cupboard. Had to raid McDonalds(easy 3 minute walk) for some, but left a supply. Thank you for the feedback, we are thrilled to hear that you enjoyed your stay at The Lagoons and that the location was just the right amount of distance from the hustle and bustle of The Village! We look forward to seeing you again soon. So close to the village. The washer and dryer were great to have after our biking adventures as was the private hot tub. Thank you for letting us stay Harmony ! Thank you for your positive review and letting us host your stay in Whistler. Great to hear that you enjoyed your time with us.